Me, who never lived the rock ’n roll life in the 80s, Im extremely happy to just look around nowadays and meet more and more bands, who give the feeling of that great, heroic time of rock and the life around it. This style seems that – thanks good- started to spread again, as a nostalgy nowadays, hopefully getting over one day the stupid trendy pop songs. 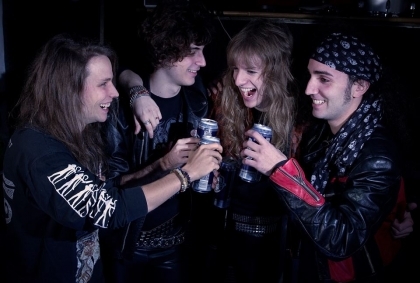 I met quite by chance Shock Rocket, a young band ruined in Italy. The four guys, -not more than 20 years old boys Im talking about-, not just play or try to play the rock n’ roll, they really live that life and the music at all. 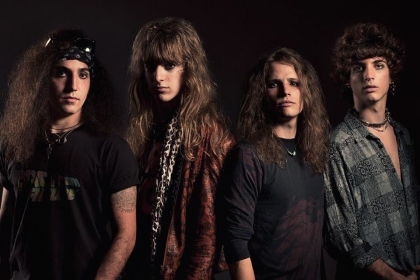 And its absolutely right: topics, songs, and the all enviroment around Marty, Marco, Andrew and Joey is full with the emotion what we usually love to call hard rock. I have no glue, if anybody could write really new or never heard riffs and melody parts for these type of early rock style, but Im sure, that everybody can form it and fulfill with an own style, added the personal soul to it. And this is perfect so. Well, Shock Rocket guys did that, there is no doubt.